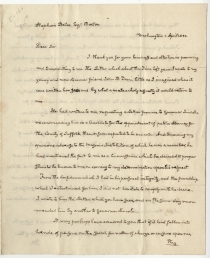 In the wake of the murder of William Morgan, a prominent anti-Mason who had threatened to reveal the society’s secrets, John Quincy Adams requested the return of an old letter. 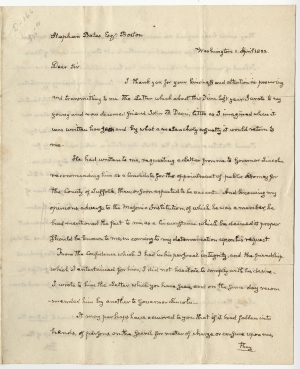 Considering the political climate, Adams thought the letter would reflect poorly on its now-deceased recipient, as well as expose Adams, a prominent opponent of Freemasonry, to public criticism for having supported a man he knew to be of good character who also happened to be a Mason. The former president, now in Congress, goes on to explain his political support for anti-Masonry, one of the first third-party political movements in the United States. JOHN QUINCY ADAMS. Autograph Letter Signed as Congressman, to Stephen Bates. Washington, D.C., April 1, 1833. 3 pp. 8 x 9¾ in. I thank you for your kindness and attention in procuring and transmitting to me the Letter which about this Time last year I wrote to my young and now deceased friend John B. Davis, little as I imagined when it was written how sad and by what a melancholy casualty it would return to me. He had written to me, requesting a Letter from me to Governor Lincoln recommending him as a Candidate for the appointment of public attorney for the County of Suffolk, then, or soon expected to be vacant. And knowing my opinions, adverse to the Masonic Institution, of which he was a member, he had mentioned the fact to me, as a circumstance which he deemed it proper Should be known to me, in coming to my determination upon his request. From the Confidence which I had in his personal integrity, and the friendship which I entertained for him, I did not hesitate to comply with his desire. I wrote to him the Letter which you have seen and on the same day recommended him by another to Governor Lincoln. 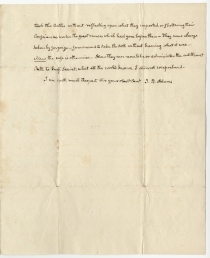 It may perhaps have occurred to you that if it had fallen into hands, of persons on the search for matter of charge or censure upon me, they would have argued on inconsistency between the sentiments expressed in this Letter, and those avowed in another to Mr. Benjamin Cowell of Rhode Island of more recent date, and which has been published; but there is no inconsistency between them at all. 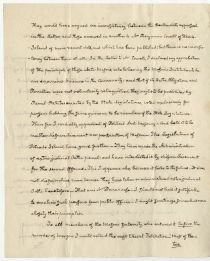 In the Letter to Mr. Cowell I declared my approbation of the principle of those Anti-Masons, who believing the Masonic Institutions to be an enormous Nuisance in the Community; and that if the Oaths, Obligations and Penalties were not voluntarily relinquished, they ought to be prohibited by Penal Statutes enacted by the State Legislatures, voted exclusively for persons holding the same opinions, to be members of the State Legislatures. Thus far I cordially approved of Political Anti-Masonry - And hold it to be neither disfranchisement nor persecution of Masons - The Legislature of Rhode Island have gone further. They have made the Administration of extra judicial Oaths penal; and have interdicted it my disfranchisement for the second offense. This I approve also, because it looks to the future. It does not disfranchise men because they have taken or administered extra judicial Oaths heretofore. That was Mr. Davis’s case. I should not hold it justifiable to exclude such persons from public offices. I might scrutinize somewhat more closely their principles. To all members of the Masonic fraternity, who entered it before the murder of Morgan I would extend the most liberal Toleration. Most of them took the Oaths without reflecting upon what they imported, or sheltering their consciences under the great names which had gone before them. They were always taken by surprize, Summoned to take the Oath without knowing what it was. Now the case is otherwise. How they can now take or administer the cutthroat Oath to keep Secret, what all the world knows, I cannot comprehend. William Morgan, mentioned by Adams, had in 1826 promised to publish a pamphlet on the inner workings of the secret society of Masonry. It would have been the first expose of its kind to be printed in America. Morgan, a former Mason, mysteriously disappeared before the tract could be published and both sides, Masons and anti-Masons, blamed the other. It was rumored Morgan was taken to the Canadian border by a group of Masons and held there before his final disappearance. No one was ever convicted of his murder, and anti-Masons charged it was due to the Masonic influence in the courts. Morgan’s disappearance has never been solved, and still invites controversy today regarding everything from Morgan’s War of 1812 service, employment and finances, sobriety, and even if he was the degree of Mason he claimed. While a significant number of Founding Fathers were Freemasons, as politics grew increasingly democratic in the Age of Jackson, many rural Americans believed Freemasonry represented urban arrogance, secrecy, and rituals that posed a threat to Republican democracy. Starting in 1826, an anti-Masonic movement gathered momentum and had a powerful impact on American politics. The Anti-Masonic movement began in upstate New York, and within a few years, spread through Pennsylvania, New England, and the Mid-Atlantic States, eventually reaching onto the Northwest Territory of the Ohio Valley. While many resented the Anti-Masonry movement, some states elected officials to Congress and their respective state governments on the Anti-Masonic Party ticket. It was America’s first third party, and was instrumental in elevating the careers of such luminaries as William H. Seward, William Lloyd Garrison, and Thaddeus Stevens. By 1836, the Anti-Masonic movement had been absorbed into the Whig Party. Here, Quincy Adams alludes to the movement, as well as explaining that his deceased friend John B. Davis’s Masonic oaths, made before Morgan’s murder and anti-Masonry movement, did not disqualify him from public service provided his loyalty to the State superseded his loyalty to the fraternity. Fine. Lightly age-toned. Tiny fold holes.